Shaun Murphy was a state finalist in the National Carer Awards, nominated by his wife Dianne for being the primary carer in their family. Mrs Murphy said the couple cared for her father before having their first son, who was diagnosed with bladder exstrophy after he was born. They spent many weeks in and out of hospital, with their son undergoing 38 surgeries over the past 18 years. They welcomed their second son in 1999 and a daughter a year later, then in about 2003, both younger children were diagnosed with autism and intellectual delays. Although he was committed to getting on with life, Mr Murphy said it had been tough. “At the point of the diagnosis of autism of our younger two, and with a son who was already unwell, it was much more traumatic than people could realise,” he said. While working full time, often six days a week, as a hydraulic fitter, Mr Murphy supported the extended family, including his parents-in-law, and took over things as soon as he got home. “My mum then got sick after we had our children, so we were caring for five family members,” Mrs Murphy said. She said her husband had always been a hard worker, but life changed dramatically again when she had a breakdown. “After my breakdown, Shaun took over the primary carer role and I started work full time to financially support us,” she said. The father now co-ordinates hospital appointments, shopping and medications and taking care of every need of the children with their early intervention and appointments. He has linked in with a male carer group and volunteers for not-for-profit organisations that support families of children with special needs, and is the parent representative on the Hospital School Services Committee, which provides education to children in hospital. 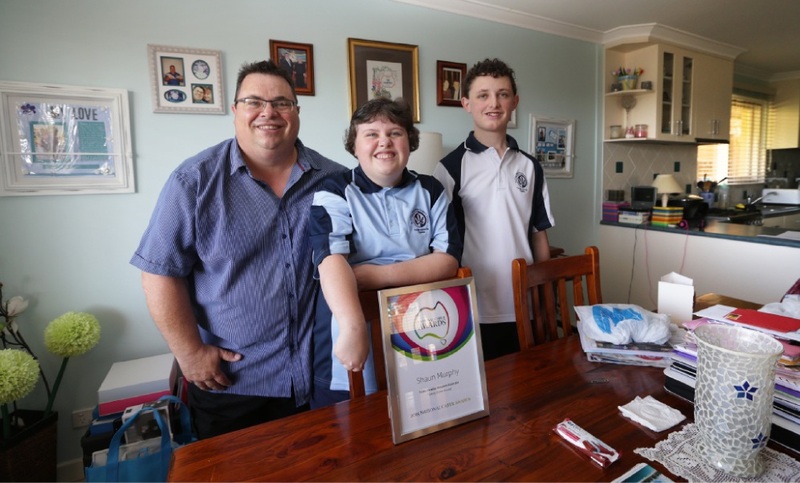 “Shaun has given presentations to student enrolled nurses at the hospital to educate them on what life is like in hospital from a parent’s perspective,” Mrs Murphy said. She said the family had raised $16,000 for charities such as Make-A-Wish and Ronald McDonald House charities by holding events in the past. A passionate angler, Mr Murphy tries to go out fishing once a month as a break from his caring roles.